Thinking of ducking into cafes, charming restaurants and beachside shacks in Pondicherry? While usually we’d gleefully approve, The Tasty Truck a fun and friendly food truck, is the latest place to be at. Weaving their way through the sleepy seaside town, this truck has Munchies On The Move, quite rightly so, painted on it. 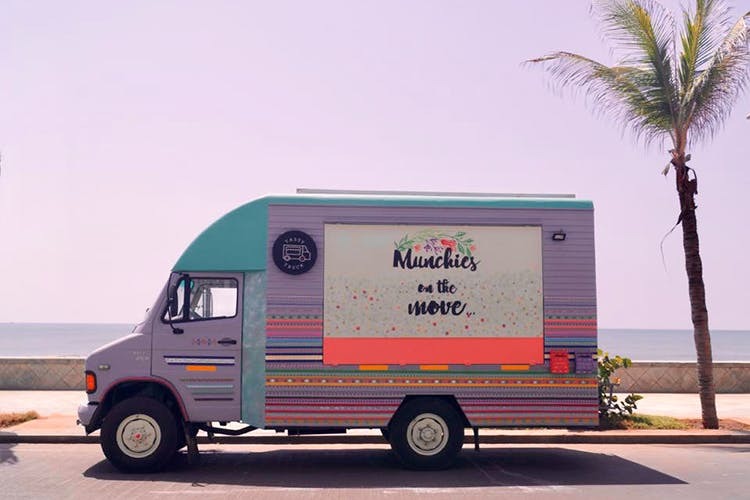 The truck was started by two friends, Rachna Rao and Justine DePenning, who were originally on a quest to find ‘culinary goodness’. They started to experiment themselves when the goodness they were looking for was rather elusive. Pleased with their own experiments, they kicked off The Tasty Truck, with chef V Karthik in tow. Currently serving up multi-cuisine street food from the pretty, pastel and pleasant van, you can load up on French Fries, kathi rolls, sliders, tacos and iced teas. We also spied some noodles that looked like they were Thai style.